BANGI, 10 Feb 2014 – Carbon Tax, a form of tax levied on the carbon content of fuels, may be practical in Malaysia and Indonesia as an effective mechanism to reduce carbon emission and air pollution while generating some revenue that can aid the very poor. Assoc Prof Dr Budy Resosudarmo of the Australian National University (ANU) said this is because both countries implement subsidies on fuel and are heavily dependent on coal power for electricity. Speaking at a lecture organised by the Faculty of Economics and Management (FEP) of The National University of Malaysia (UKM), titledEconomy – Wide Impacts of a Carbon Tax in ASEAN, Dr Budy said the tax should be levied on heavy industries but would not burden the lower income group. Noting that the other ASEAN nations do not provide any assistance on fuel consumption, the economist described carbon tax as a potential form of a balance to the subsidies burden borne by the governments that implement them. He proposed that 50 % of the revenue gained by the carbon tax be used to subsidise the hardore poor, while on the other hand the industries that pay the levy should be given some tax relief. In the poorer nations of South-East Asia such as Vietnam and Cambodia, the amount of revenue brought in by carbon tax would not compensate for the potential hardships felt by the general population, which may cause widespread bitterness and thus instability. In the richer but small countries such as Singapore and Brunei, a carbon tax would not make much sense as there are not much heavy industries using fossil fuels and fewer vehicles compared to Indonesia and Malaysia. Using a computer-generated economic scenario known as GEMS, Dr Budy proposed that the tax be levied at a rate of US$10 per tonne of carbon emission. He was confident that with some fine-tuning and tweaking, Malaysia and Indonesia can achieve some impact on higher household incomes in the longer term. Dr Budy described carbon tax as an effective mechanism to reduce carbon emission and air pollution while generating some revenue that can aid the very poor. He suggested that it is worthwhile for implementation in Indonesia and Malaysia, although the increase in revenue would be negated by the subsidies. However, the most important consideration is political, in which household and industries can be compensated. He believed the benefits don’t seem apparent in the case of Singapore, Thailand and the Philippines. Carbon taxes can be a regressive tax, in that they may directly or indirectly affect low-income groups disproportionately . The regressive impact of carbon taxes could be addressed by using tax revenues to favour low-income groups. Also present at the lecture were Deputy Dean of the FEP Prof Dr Ishak Yusof and Prof Dr Jamal Othman, a consulting economist. Dr Budy is the President of the Pacific Regional Science Conference Organization (PRSCO), a body that enhances and facilitates exchange of research information in the field of regional science among members. Dr Budy joined the Economics Department of ANU in October 2001. 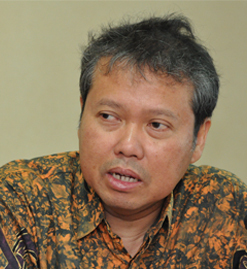 Prior to that, he was a lecturer at the Graduate Program in Economics, University of Indonesia as well as a researcher at the Indonesian Agency for the Assessment and Application of Technology. His research activities include investigating the political economy of natural resource utilisation, determining the economy-wide impact of environmental policies, assessing the relationship between environmental quality and human capital, and analysing the impact of decentralisation on regional economies. He was researcher at the Agency for the Assessment and Application of Technology (1996-2001), Fulbright visiting fellow at the JF Kennedy School of Government, Harvard University (2001) and postdoctoral associate at the Community Development and Applied Economics, University of Vermont (1998-1999).